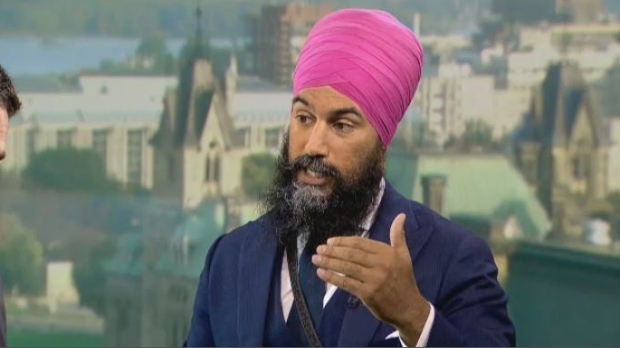 NDP leadership candidate Jagmeet Singh on CTV's Question Period with Evan Solomon. OTTAWA – NDP leadership hopeful Jagmeet Singh is eyeing Brampton East, the federal riding held by Liberal MP Raj Grewal, as his ticket in to the House of Commons. In an interview with Evan Solomon, host of CTV's Question Period, Singh said he'd want to run in a riding where he has roots, and the Brampton East riding would fit the bill. "My current riding is in Bramalea-Gore-Malton," Singh said, referring to the provincial riding he's held since 2011, "which would reflect Brampton East, that's the riding that makes the most sense, where I've got the history." Grewal, his prospective opponent, is a rookie who won the federal Brampton East riding for the Liberals in 2015, with 52.3 per cent of the vote. Both men are Sikh, under the age of 40, and worked as lawyers before entering politics. Bramalea-Gore-Malton includes part of Brampton, and the area has a large Sikh population. When asked if he'd consider a run earlier, potentially in the Scarborough-Agincourt, Ont. seat that was vacated as a result of Liberal MP Arnold Chan's recent death, Singh said it’s something he'll have to think about, but right now he says he's fine to wait until 2019. "I'd be open to hearing opinions on it, but again I'm not uncomfortable with the fact that I don't have a seat right now." He said he's okay to hold off because he’s interested in following in the footsteps of Jack Layton, who did not have a federal seat when he became leader of the NDP. Brampton, Ont., is the city where Singh started his political career. It’s also where a now-infamous heckler confronted him at a campaign meet-and-greet just days before the final NDP leadership debate. The woman angrily accused him of supporting Sharia law and clapped in his face. The interaction and Singh's response circulated worldwide. Video of the incident has been viewed more than 519,500 times since it was uploaded to YouTube. "Love and courage can be in different ways. It can be to defend yourself, it could be to name the injustice," he said in the interview, speaking about the way he responded to the woman who got in his face. Though, despite running a campaign focused on love and courage, Singh said there have been times in the past where he has responded differently. "From when I was a young person until when I was in university, people would come up to me and physically want to fight with me just because I look different," he said. Singh said he's been called a terrorist, and have had people come up and pull his turban off of his head. "I’ve been faced with a lot of aggressive people who have come right up into my personal space," he said. When asked if he’d ever used his mixed martial arts and Brazilian jiu-jitsu training in a physical altercation Singh replied, "yeah I had to lots of times. I did all right."